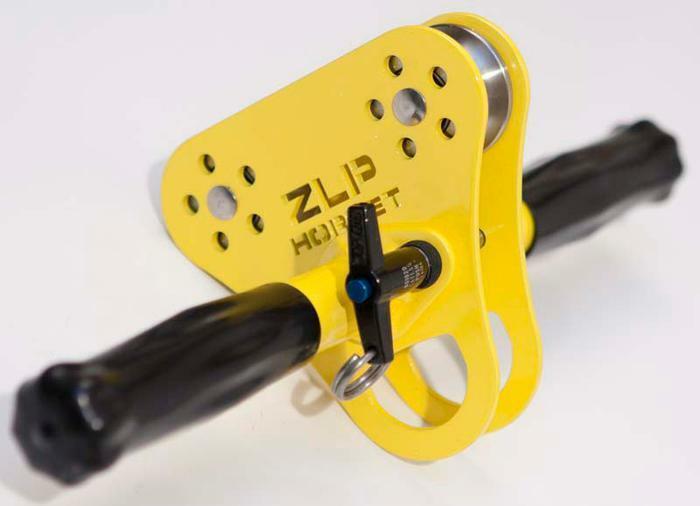 ZLP Manufacturing of Milwaukie, Ore., is recalling about 2,000 LP Hornet zip line trolleys. The retaining pin can release and cause the two side plates of the trolley to separate and fall off the zip line, posing a fall hazard. The company has received two reports of the trolley falling off a zip line when the retaining pin released. No injuries have been reported. This recall involves the ZLP Hornet zip line trolley. The trolley has yellow, triangular side plates with ZLP Hornet cut into one of the plates. There are rollers at two corners of the side plates and a handle through the center with black handle grips. The yellow side plates are held together by a T-shaped retaining pin. The pin can be released by pushing a blue push-button on the end of the pin. The trolleys, manufactured in the U.S., were sold at www.zlpmanufacturing.com and www.backyardziplines.com from November 2010, through July 2013, for about $150. Consumers should immediately stop using the recalled trolleys and contact ZLP manufacturing to receive a free repair kit containing a replacement retaining pin. Consumers may contact ZLP Manufacturing toll-free at (888) 771-2579 from 8:30 a.m. to 5 p.m. PT Monday through Friday.